Nature lovers from all over the world come to stay for a few nights. Why? 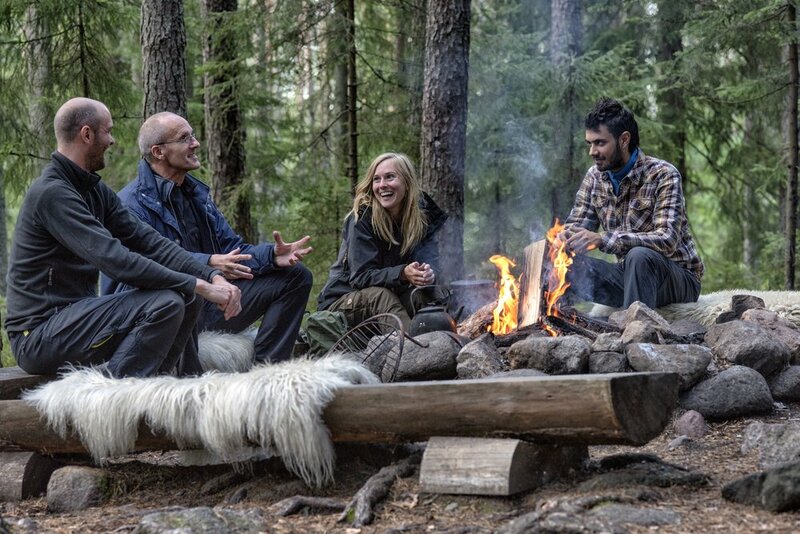 For an adventure in Sweden’s nature and unusual experiences off the beaten track. For peace, quiet and late nights by the camp fire. To spend time with best friends or family. For outdoor activities like hiking, canoeing and to forage for berries and mushrooms. To watch for moose, beavers, wolves and other wildlife. Kolarbyn Ecolodge is located in the forest in Skinnskatteberg, just a two hours drive from Stockholm. You won’t need a car as you can easily get here by public transport. Kolarbyn is a place to stay... but not a hotel. Kolarbyn is a place to experience nature... but not a park. When you first arrive at Kolarbyn, you will be greeted by pine trees, spruce trees and birch trees, a proper forest! Everything is green here. But if you look closer you will soon find that in between all trees are twelve little cabins. Well camouflaged, covered in mud and grass. Bilberries and mushrooms grow wild on their roofs. Kolarbyn is an ecolodge in it’s true sense. One guest called them mud-holes, someone else called them hobbit houses. The huts can’t speak, so we don’t know what they prefer to be called. We simply call them forest huts. 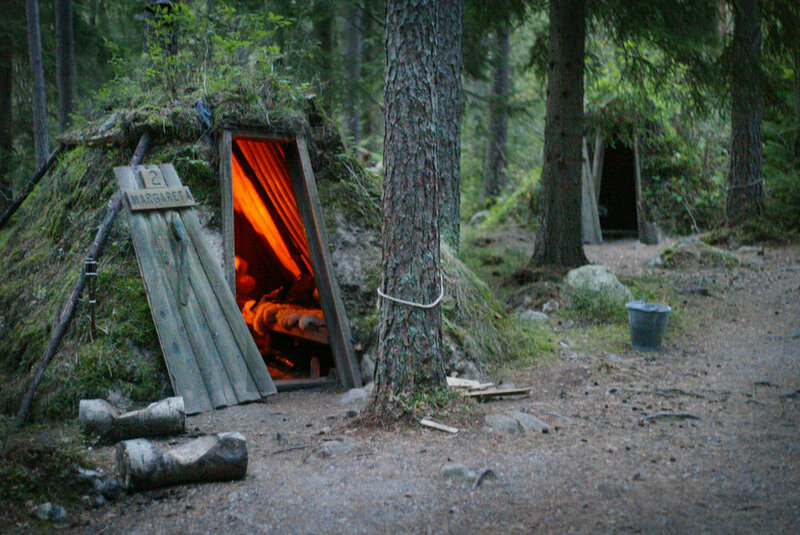 Back in the days, forest workers used to stay in these. They're authentic. You can read the true story of Kolarbyn here. One of the twelve forest huts at Kolarbyn Ecolodge. You lift off the door to enter. Moss and berries is growing on the roofs. Two beds with sheep skins for sleeping bags, and a fire place to keep you warm. What else do you need? Can I really sleep there? 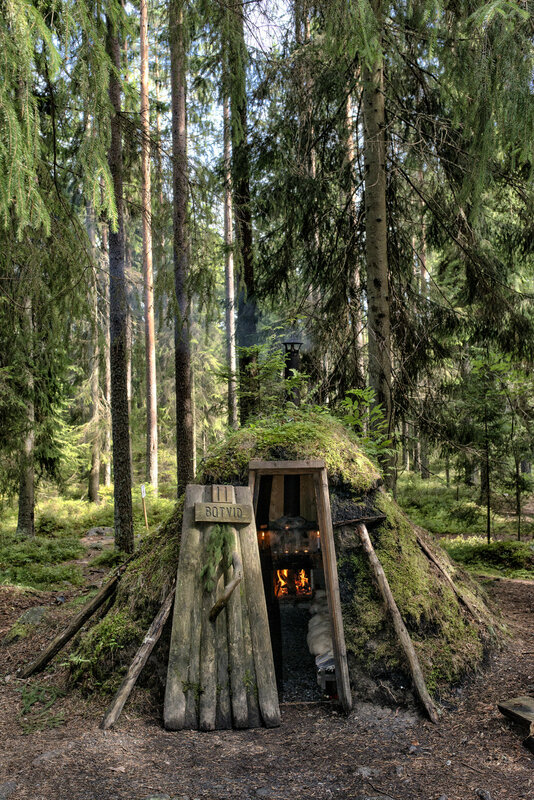 Each forest hut has two beds and a fire place. Wooden beds. No spongy mattress. But with layers of insulated air-mats and a topping of sheep skin rugs. Pretty comfy, but not as soft as your own bed at home. Roll out your sleeping bag. Lay down. Close your eyes. Fall asleep to the sound of the crackling fire. If you are a family of three, just ask for an extra bed. If you are a family of four or more we have one family hut, or you will need two huts close to each other. I just woke up! What time is it? Doesn’t matter. Just take is slow. Listen… the birds are singing. Take a deep breath. Ask a tree what is truly important in life. Put your boots on. Light a fire, boil some coffee or herbal tea. Then take a refreshing swim in the lake. It is a new day for adventures! But you don’t have to be adventurous. Kolarbyn is a place for regular nature loving people like you and me. Adventures can be little, slow and safe. The fire place is where it all happens. You won’t need wifi. Instead connect with nature. Remember we are all part of nature. Enjoy with passion. Its organic and fair trade. Kolarbyn is located by Skärsjön, my favorite lake in Sweden. Clear and tasty. Cook outside, or cook in here. This is the communal building. A place to sit down and talk. When you are hungry... visit the small food shed. There you will find basic groceries like pasta, tomato-sauce, bread, müsli, fruits, eggs, coffee, tea, some fresh vegetables, spices, pancake-mix, frying oil as well as syrup for your berry drink. Most of the food items are of organic produce. Use these as ingredients for your breakfasts, lunches and evening meals. Remember there is no kitchen. Prepare your meals over open fire. We provide pans, plates, knives and much more. You don’t have to be Crocodile Dundee or Ray Mears to survive at Kolarbyn. Our hosts are here to help you. And we will eat some of the meals together during our safaris. Pee behind any tree, but not on the berries! Kolarbyn has two tidy little toilet sheds, with framed pictures of the Swedish King Carl-Gustav and Elton John (don’t ask). Flush with soil. Wash your hands in water from the stream and some natural soap.